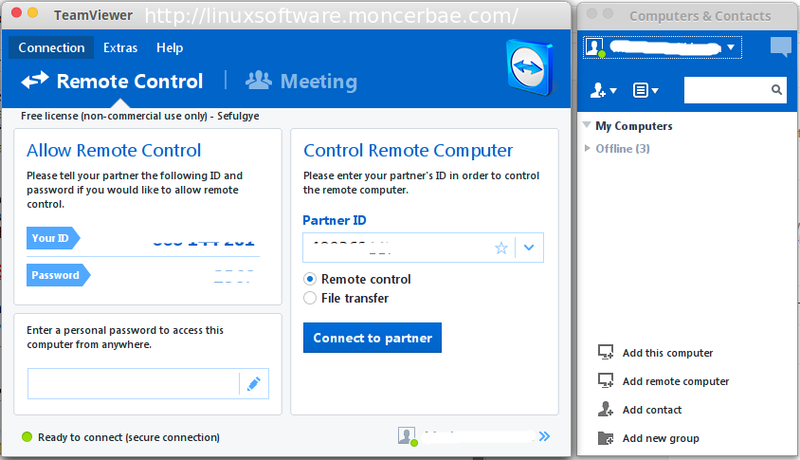 TeamViewer The Best Online Meeting Software Linux with remote support. TeamViewer is the All-In-One Software for Remote Support and Online Meetings which can run on many platform include Linux, Mac, and Windows. So if your partner using different operating system it doesn't matter. With TeamViewer you can do a remote control any computer over the internet within seconds or use TeamViewer for online meetings. This is why TeamViewer has been activated on more than a billion devices. TeamViewer is ready to use, right after downloading! Download, execute, and get started! - Your first session will start in less than a minute. Commercial users are welcome to use these downloads for trial purposes. TeamViewer is free for all non-commercial users! For installing TeamViewer for Linux, we recommend using the graphical installer. The graphical installer can be invoked by (double) clicking the downloaded package. If this is not the case and, e.g. the Archive Manager opens up, open the context menu instead (right-click on the downloaded package). Depending on your distribution you will get different possibilities to install the package, e.g. “Open with software installation”, “Open with GDebi package installer”, “Open with Ubuntu Software Center”, or “Open with> QApt package installer”. On newer 64-bit DEB-systems with Multiarch-support (Debian 7) teamviewer_linux_x64.deb cannot be installed because the package ia32-libs is not available anymore on these systems. In this case you can use teamviewer_i386.deb instead. If you don't want TeamViewer not running when your computer start, you can configure the preference program through TeamViewe Menu: Extras >> General >> uncheck the "Start TeamViewer with system" and Done! If you close TeamViewer it still remain on your panel task bar, to quit TeamViewer simply from the Panel bar of your Linux: right click on TeamViewer icon and select Exit TeamViewer.